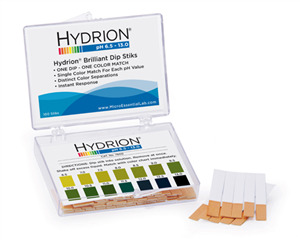 This Hydrion Brilliant pH Test Dip-Stik provides excellent color separation in the neutral to alkali range. These short-range Dip-Stiks offer clear bright single color matches at every .5 interval from pH 6.5-13.0. Each carton contains 10 cases with 100 strips per case. Provides for approximately 1000 tests. There is no video for this specific product. Check out all of our Instructional Videos at our Knowledge Center.